Dr. Mercy Beljorie is a UK qualified Obstetrician and Gynaecologist with a special interest in early pregnancy complications, intrapartum care, high-risk deliveries, obstetric emergencies, infertility and obstetric ultrasounds. She has 20 years of experience in Obstetrics and Gynaecology field and has worked with Mafraq Hospital (SEHA), Abu Dhabi as a Specialist Obstetrics and Gynaecology for over 6 years. She was last associated with Macclesfield Hospital – NHS, UK as a specialist physician. 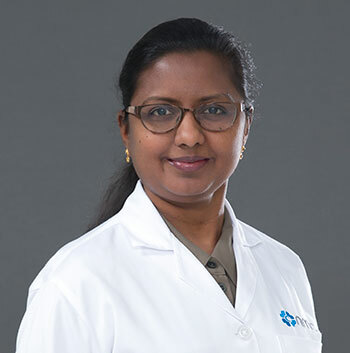 Dr. Mercy has over 17 years of experience in working in GCC as she was also associated with King Abdullah Hospital in Bisha, Kingdom of Saudi Arabia for 11 years. She is a Member of the Royal College of Obstetricians and Gynaecologists (MRCOG), UK since 2006 and Royal College of Physicians of Ireland (MRCPI) since 2015. She is also the life member of World Association of Laparoscopic Surgeons (WALS) and has completed Diploma in Minimal Access Surgery from World Laparoscopy Hospital, Gurgaon, India in 2013. She also obtained Certificate in Assisted Reproductive Technology from World Laparoscopy Hospital and Balaji Fertility and IVF Centre in India. She completed her MBBS from Madurai Medical College, Affiliated to Madurai Kamaraj University, Tamil Nadu, India. Dr. Mercy is an education enthusiast and loves teaching. Her vast experience in academic teaching at Mafraq Hospital and Macclesfield Hospital has earned her the reputation of being an excellent tutor. Besides teaching undergraduate medical students, she also has presented lectures and audits in various CME's and symposia, in Saudi Arabia and in Abu Dhabi. Dr. Mercy speaks Tamil and English languages. She can converse in Arabic.